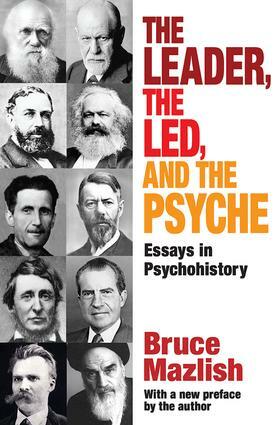 In this book of absorbing stories, Bruce Mazlish illuminates the lives of intellectual and political leaders with the penetrating light of psychohistory and in doing so illuminates our own lives as well. A pioneer in this field, Mazlish demonstrates that study of the origins of leaders—their personal history—can help us understand their work, and that only in a study of their context, can we grasp their impact on events. Mazlish brings the insights of psychoanalysis to bear on a wide spectrum of leaders, beginning with those who created the theories of psychoanalysis: Darwin, who began to uncover the story of the human species; Freud, whose theory of individual behavior was rooted in Darwin's evolutionary biology; and Nietzsche, whose philosophy can be seen as a precursor to Freud. He studies intellectual leaders whose work stimulated political change: Marx, who inspired a revolution and "a great secular religion"; Thoreau, who fantasized independence within a dependent life; Jevons, whose economic theories reflected a private tension between ambition and duty; and Weber, a man of reason and passion, whose theories emerged from personal traumas. A section on political leadership examines polar opposites: the raging mystic but opportunist Khomeini; and Orwell, whose hatred for totalitarianism was less fierce than his passive fear. A final section on the psychohistory of groups focuses on the United States, exploring the polarities of American life, its light-dark dichotomies. Mazlish finds that these ambivalences explain "the American psyche"—from the Puritan's melancholy conscience and Washington's sense of parental betrayal that compelled a break with the father-mother country to Nixon's uncritical self-righteousness and his conviction of being always under attack.